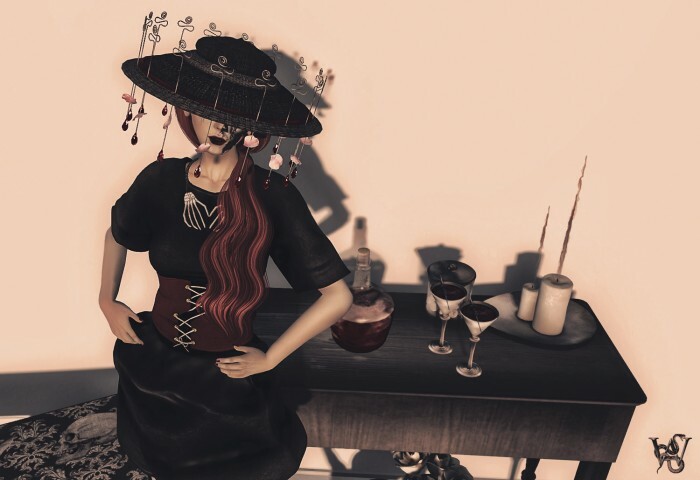 I was looking at the new hats from Eleseren Brianna, which she made for the upcoming Art in Hats event. My heart was caught by the “Death of a Romanic Hat”. The hat to me really is a little piece of art. It is a firework of textures and shapes. With the sweet and filigree, artistic decorations around that head it definitely will turn heads. To complete my look I put on the “Grimm Dress” from [sys]. The dress was released on one of the Collarbor 88 events. The dress comes with glasses and a hat, but for today I just used that amazing dress. For shoes I chose the “Lipstick Heels” from Wicca’s Wardrobe. The shoes are made for the Slink mesh high feet and won’t work n regula avatar feet. The awesome furniture I arranged around myself is one of GizzA’s latest releases. The pieces are all part of a Gacha in an event called “Lost and Found”. 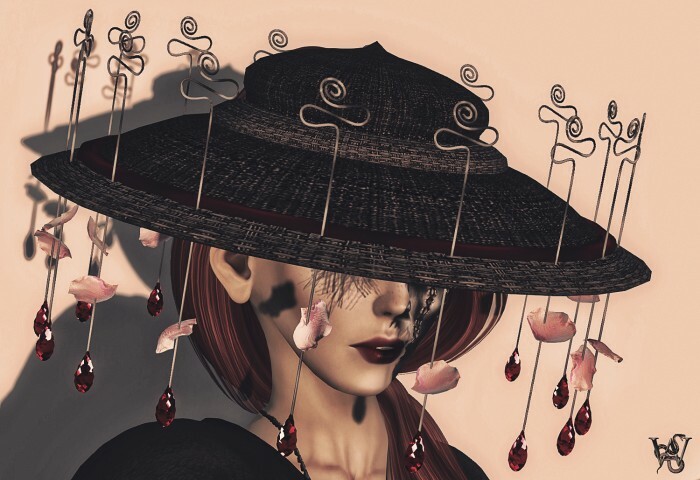 This entry was posted in Charity, Awareness, Help & Fundraiser, Fashion and tagged 3D, 3D people, Art, art in hats, artinhats2015, avatar, bench, Blog, Blogger, bloo, candles, Clothing, Cocktail, Collabor 88, Collabor88, corset, Costume, Couture, Decor, Devilish Poses, Eleseren Brianna, Fashion, Fashion in Pixels, fashion poses, Female Clothing, female wear, Giz Seon, Giz Seorn, GizzA, Glass, Hair, Halloweeen Funiture, Halloween, High Fashion, Jewelry, Linda Redevil, Lost and Found, meta virtual, Model, model pose, Model Poses, Modeling, Modeling pose, Modeling Poses, New, New Release, New Releases, News, On 9, On9, photographer, Pose, roses, Second Life, Secondlife, skull, SL, SL Clothing, SL Fashion, SL Style, Style, sYs, table, Virtual World, Wicca Merlin, Wicca's Wardrobe, woman. Bookmark the permalink. This is a great hat and I love the way you styled it. Great blog entry!